It's Friday!!!!!! It's time for a new challenge at QKR Stampede challenge blog! The challenges are weekly, and they are Anything Goes! Yea! 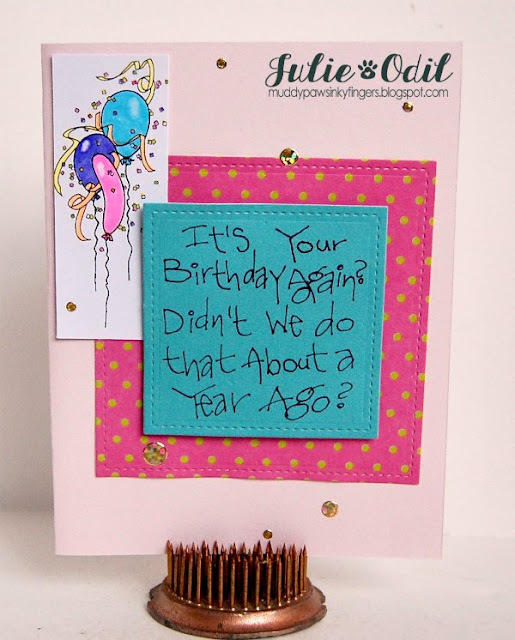 I used the sentiment as the focal point of this card because I thought it was just so darn fun! The sentiment is Birthday Again (Q-digi17206). The Small Party Balloons (ES-digi4205) were colored with Copic markers and gel pens on the confetti. This card is a wrap! I hope to see you this week at QKR Stampede Challenge blog for our Anything Goes challenge!